Adding to the list of odd games released today would be Flying Oak Games release of Dead End for both iOS and Android Devices. 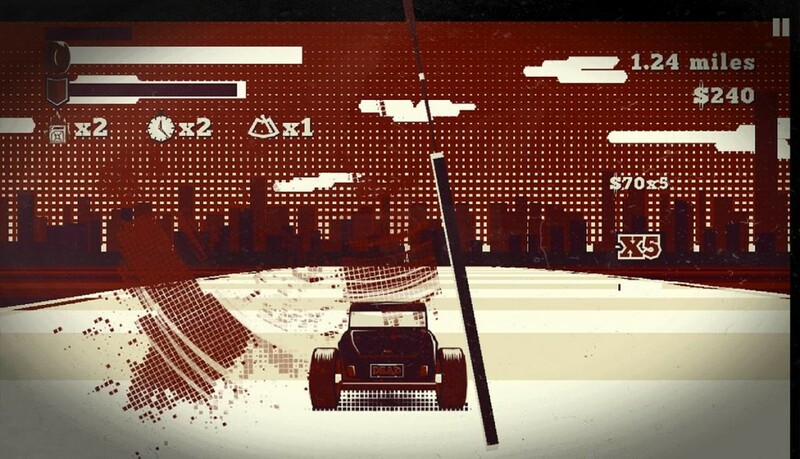 If you haven’t yet heard about Dead End, it is a mix between those grindhouse horror movies and old-fashioned racing games, which is a rather unique mixture. The main thing you should notice right off the bat with Dead End is the unique artwork and graphics which I find adds to the awesomeness of Dead End and it really gives you that old-fashioned vibe along with the grindhouse vibe you have been craving for so long. I would also like to mention that Dead End is an endless racer which is a nice little change of pace for those of you who are fans of the highly popular endless runner genre. Dead End will also feature atypical monochromatic graphics, the awesome ability to smash zombies while using your wind-shield wipers to clean off all the zombie debris, the ability to upgrade your car, and lastly you are able to complete missions. If a grindhousey, zombie-smashing, endless racer is right up your alley than you can pick up your copy now in the Google Play Store and App Store for free, but you will need to use an IAP to purchase the full version of the game for $1.99.